The two Koreas will cease hostilities and seek increased cooperation and denuclearization as part of the declaration announced following an inter-Korean summit at Panmunjeom. The Panmunjeom Declaration, revealed after a daylong summit and related events, outlines measures for improving inter-Korean relations including executing previously agreed measures and holding high-level talks regarding diverse areas. 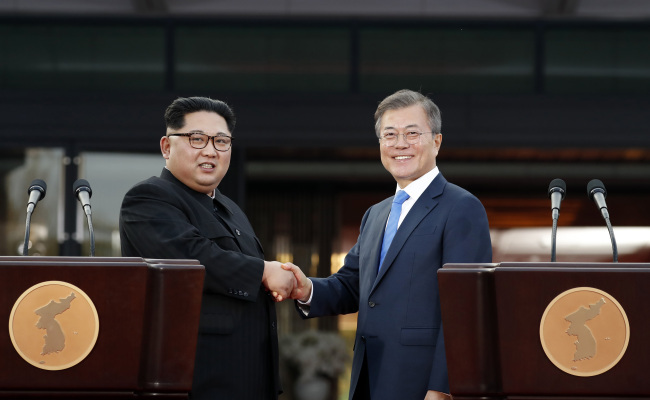 The two Koreas also said they would seek a peace treaty and hold three-way negotiations with the US, or four-way negotiations with the US and China if necessary. 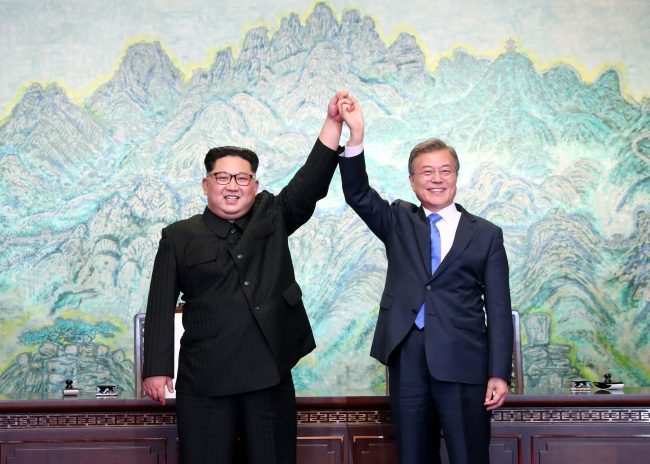 “(North Korean leader Kim Jong-un and I) declared that there will not be war on the Korean Peninsula and that a new era of peace is beginning,” President Moon Jae-in said. Moon and Kim also agreed to meet again in Pyongyang in autumn, and to hold a reunion of families separated by the Korean War on Aug. 15. Saying that he and Kim confirmed that “realizing a nuclear-free Korean Peninsula is our shared goal,” Moon praised Kim’s earlier move to freeze nuclear and missile tests. On April 21, North Korea announced its decision to halt missile and nuclear tests, and to shut down the Punggye-ri nuclear weapons test site. “We agreed to take the lead in deciding the fate of our people, but cooperate to win the support and cooperation of the international community,” Moon said. “Above all, (we) share a firm will to open a new era in which the entire race lives in a peaceful land without war, and agreed on practical measures,” Kim said, adding that putting past agreements into action will be the first step. South and North Korea have reached a number of agreements in the past, but the declaration of Oct. 4, 2007 --signed by late President Roh Moo-hyun and North Korean leader Kim Jong-il -- had been heavy on economic cooperation. Friday’s declaration, however, goes light on denuclearization, which Cheong Wa Dae had repeatedly stressed as being the main focus of the summit talks. “The will to realize a Korean Peninsula without nuclear (weapons) was confirmed,” the official said on the condition of anonymity, adding that the expression “complete denuclearization” should be highlighted. The official declined to comment on South Korea’s role in denuclearization, and whether the expression includes the US’ nuclear umbrella. US President Donald Trump reacted quickly to the developments with tweets. “After a furious year of missile launches and Nuclear testing, a historic meeting between North and South Korea is now taking place. Good things are happening, but only time will tell!” Trump wrote on Twitter, just over an hour after the declaration was announced. Japanese Prime Minister Shinzo Abe, meanwhile, appeared more cautious, saying that he will continue to watch North Korea and urging the country to take concrete action. “I welcome and take them as positive moves,” Abe said in press conference held after the inter-Korean summit. “Japan will compare the latest declaration to the previous ones and respond according to the analysis,” Abe said, adding that Tokyo will continue working closely with Seoul and Washington on the issue. Friday’s inter-Korean summit events began at 9:29 a.m. with Kim crossing the Military Demarcation Line, guided by Moon. Kim, the first North Korean leader to set foot in the South, was escorted by a traditional ceremonial guard and inspected a South Korean military honor guard. In an unscheduled event, the two sides took a group photograph before heading to the Peace House for a pre-summit conversation, and later the summit meeting. Along with Moon, his chief of staff Im Jong-seok and National Intelligence Service Director Suh Hoon attended the meeting in the morning that lasted from 10:15 a.m. to 11:55 a.m. Kim was flanked by his sister Kim Yo-jong, and Kim Yong-chol. Events in the afternoon began with Moon and Kim planting a tree, and taking a stroll around the grounds, ending with the two having a private discussion lasting some 30 minutes. Kim was joined by his wife Ri Sol-ju later in the day for a welcome dinner hosted by Moon and first lady Kim Jung-sook.